The last Kundalini Chakra Yoga series for the year was one of the best classes in 2018. The feedback from the participants about their experience over the past 2 weeks was so encouraging. The one feedback I got was from a millennial who was addicted to cocaine as well as weed. After he began practicing daily, he stopped both altogether and in his own words he said "I can get and maintain a natural high with Kundalini Yoga”. We combined both the upper and lower Chakras kriyas, going back and forth between both planes and I challenged the participants even more with really tough asanas and kriyas and they pleasantly surprised me by performing them with concentration and good technique. They really pushed themselves and since they had been practicing for 2 weeks, they had more stamina, focus and awareness and were much more centered. We ended with master poses for each Chakra and then a long meditation focussing primarily on the heart for love and acceptance and then a visualization of each persons intention. After the class we had a QnA for 15 min, as we do after each and every class and then the students enjoyed some of my mother’s home made Xmas sweets and cake. Looking forward to many more workshops and interactions with my students in 2019! The "Chakra Yoga Series" workshop kicked off to a good start. We had a full house as usual and everybody was very enthusiastic to learn and grow and "experience" Kundalini Yoga. Out of the 18 participants, none had been to a Kundalini class and the challenge I posed to them was to be "open, receive and experience Kundalini energy" and to give honest feedback after the class. As is customary in this tradition of Yoga, we "grounded, rooted" and "chanted" and then started to open up the body with a Vinyasa flow. We ended with a healing light meditation and a lot of people felt a blissful catharsis and a few got very emotional as is the result of detoxifying negative emotions and energizing the chakras and the body and psyche with love and forgiveness. Everyone is very excited about the next workshop on the 16th and so am I. The Kundalini Tribe is growing and more power to us!!! The 24th Workshop marked the final class of the Kundalini Trilogy 2 series. We had a full house and the class began with a great vibe. Many of the participants had signed on for the whole series which is always recommended so they were familiar with the Rooting and Grounding practice and the "Kundalini Vinyasa flow". We moved through the Chakras in sequence, cleansing and aligning them with Deep Squats, Mantras, Mudras and Breath of Fire. It was a challenging class with everyone breaking into a sweat and the participants really pushed themselves and I could see a marked improvement in the practice of the regular participants. This gives me a sense of fulfillment to see their progress and enthusiasm and dedication. We started the meditations with "Reverse Adi Shakti Kriya", a selection of Asanas to balance the Emotional and Physical bodies and bless ourselves with love and compassion. We then moved onto the "Kirtan Kriya for 11 minutes to balance all 10 bodies including the left and right brain. We then sealed the practice with a "Yoga nidra" meditation to attract something they wanted to manifest into their lives. 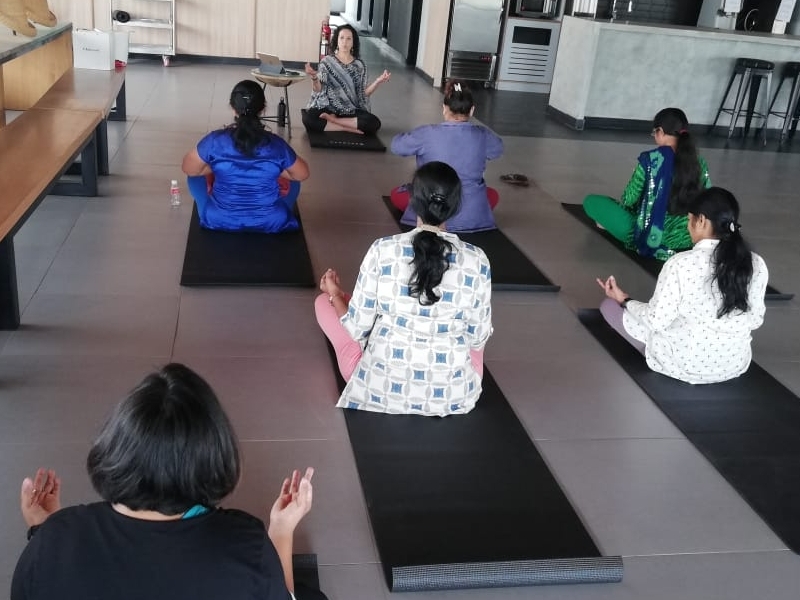 The participants were really excited about the next Kundalini series on "Chakra Yoga" and left the venue feeling fulfilled, calm and energized. Some participants did a 20 Min free consultation with me and decided to work on customized therapy sessions with me as they feel thy want to enter 2019 with their full potential. The 17th Workshop on Sexuality and Sensuality, the 2nd in the Kundalini Trilogy 2 series had a good response. Almost an equal number of men and women attended. As is mandatory, we started the practice by seeing an Intention for the class and we grounded into the Mother Earth energy with Mantra, Mudra, chanting and breathing. We then started with a 3 round Vinyasa with a Kundalini kriya sequence to detoxify and ground the lower 4 chakras, 2 major and 2 minor chakras and to activate the "panic energies". We then mentally, physically and emotionally tuned into our Mooladhara and Swatishtana chakras to give us an awareness into what it" feels like" to be "sexual and sensual beings". Using our hands to touch our bodies without any shame and judgement, we connected energetically to each Chakra and meditated with me, Avril, walking the participants through a visualization for each chakra. We ended with the 6 part MICRO COSMIC ORBIT PRACTICE to "feel and radiate Bliss" in our entire physical and energetic bodies. As is the Kundalini practice dictum, we ended with a meditation. This time it was a guided meditation to ground and fire up and balance all our major and 2 minor chakras. We also connected the Pranic and Panic energies. The feedback was awesome and for this I am truly grateful as it is my Life purpose to guide people to a life of fulfillment and true happiness. The first class of the Kundalini Trilogy Series 2 started with “Youth and Vitality” as the focus! The 12 participants were very enthusiastic and received the class with openness and great energy! 10 were new to Kundalini yoga and so as usual I always run the class through the Pillars of Kundalini and the basics. We started with opening out the lower 3 minor and major chakras and detoxifying the lymphatic system and endocrine system so that we could have open and clean vessels for the practice. We did “Kundalini vinyasa” and then started the Kriyas for youth and vitality! Participants found the practice challenging and invigorating! We ended with a system I created that I call “senses visualisation” to make visualisations 100 times more effective! We also did a shavasana and of course we had lots of chanting which the participants always love! Looking forward to the next workshop on the 17th! 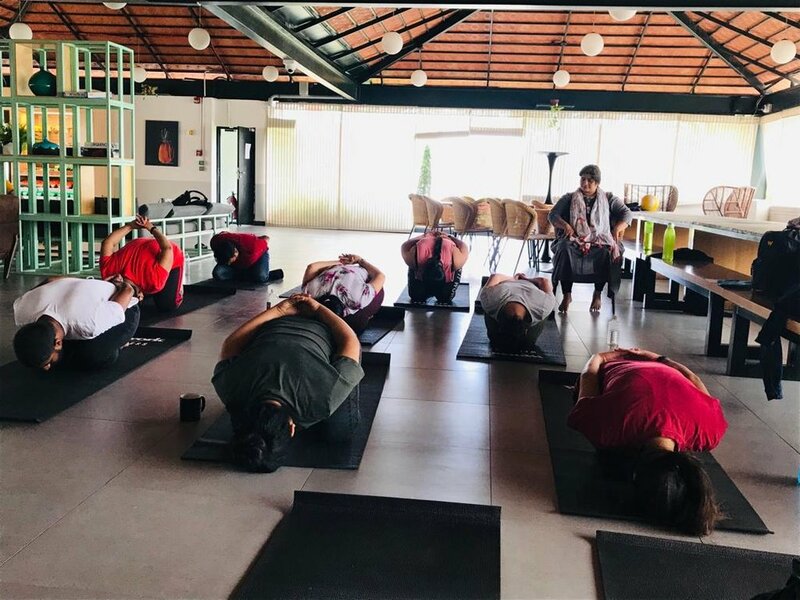 There were 12 participants for the Kundalini Yoga for Financial Abundance workshop at Tryst Studios, an open air beautiful space. Within 5 minutes of starting the class, participants said they felt a surge of energy and a calmness at the same time. We first rooted our lower chakras and then detoxed the major glands in the endocrine system for optimum benefit from the subsequent kriyas, mudras and meditation. We performed a rigorous preparatory physical practice to move energy and eliminate toxic energy from all "10 bodies". We then started the 45 minute Kriyas and meditation for Financial Abundance. Finally we ended the practice with "imagineering" a process of shavasana, visualization and intuition sharpening. The participants loved the class and felt rejuvenated. We had a good interactive session at the end of the class. Do read what they had to say about the workshop in the feedback section below! Looking forward to the next Kundalini Trilogy series in November! 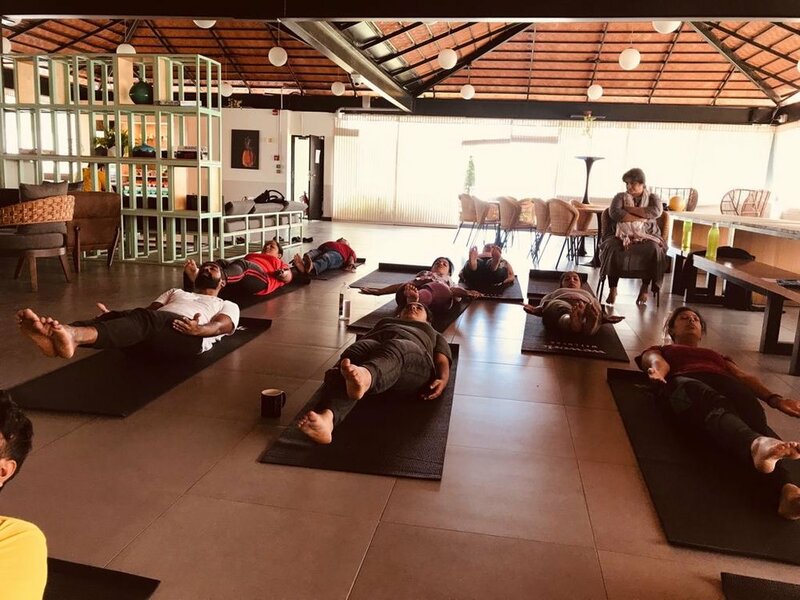 In the last of the Kundalini trilogy workshops held on the 18th of August at WEWORK, Koramangala, the participants really stepped up their game on the Yoga mats and very courageously dived into what I would call - an Intermediary Level 2 class. We engaged in a lot of Vinyaysa flows with tough Kundalini Frog Kriyas and Malasana dynamic squats with lot of chanting. All the ladies were sweating out toxic energy and melting away unwanted fat. We focused on clearing the lower 3 chakras to allow Money Energy to flow in and we even focused a bit on the heart to start healing and let go of “Self Blame” and other unwanted negative thought processes. We then did Kundalini Kriyas to get our brain hemispheres to work in harmony and ended with a “Joining Heaven and Earth” Meditation to align our Spiritaul Energy and Grounding Energy. Can’t wait for the next series in October!!! The Kundalini Metabolism workshop saw 15 participants who were eager and enthusiastic. The workshop participants were all women....so it was a lot of powerful Female "shakti" at the venue and the vibrations of the Mantras, Mudras and kriyas was invigorating to all of us! The Kriyas were challenging, however the ladies pushed themselves through it and the feedback after the workshop was A+. I am so happy to be of benefit to so many people and especially to all my sisterhood. The 1st Workshop in the Kundalini Trilogy workshops started off with a bang. We had all female participants. A few of them had come to another workshop I did at Tryst Studios and signed up for all 3 in the trilogy series. We worked specifically on 4 different systems of the body and modifications were offered as we had a few ladies with physical limitations. We had a beautiful 6 minute chanting session and a blissful meditation at the end. I also did private consultations with no charge as my way of giving back to these wonderful ladies and I hope to work with some of them through customized sessions for their healing and well being. Here are a few glimpses from the workshop and a look at what some of my amazing workshop attendees had to say about their experience! 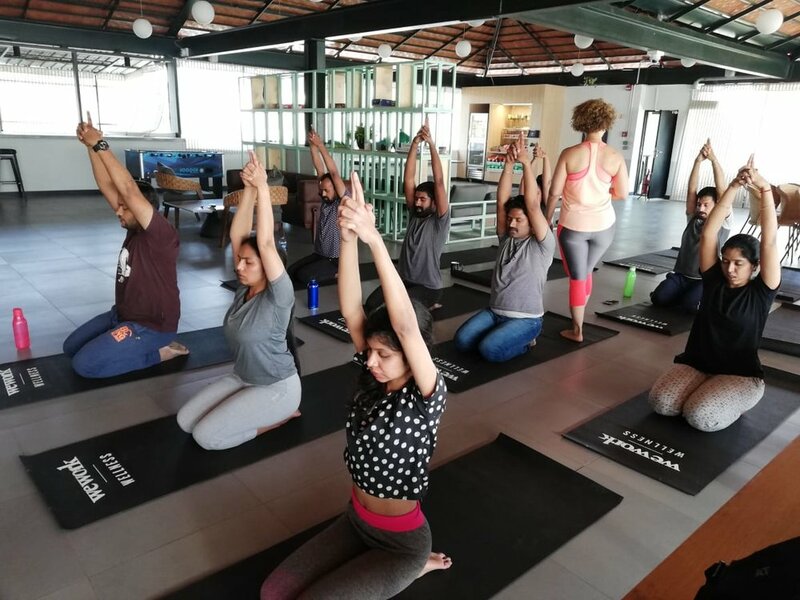 On Saturday 21st July, Avrils Qs in collaboration with Mimansa at Foxtrot hosted a Yoga Brunch event - BEND, BREATHE, BRUNCH. 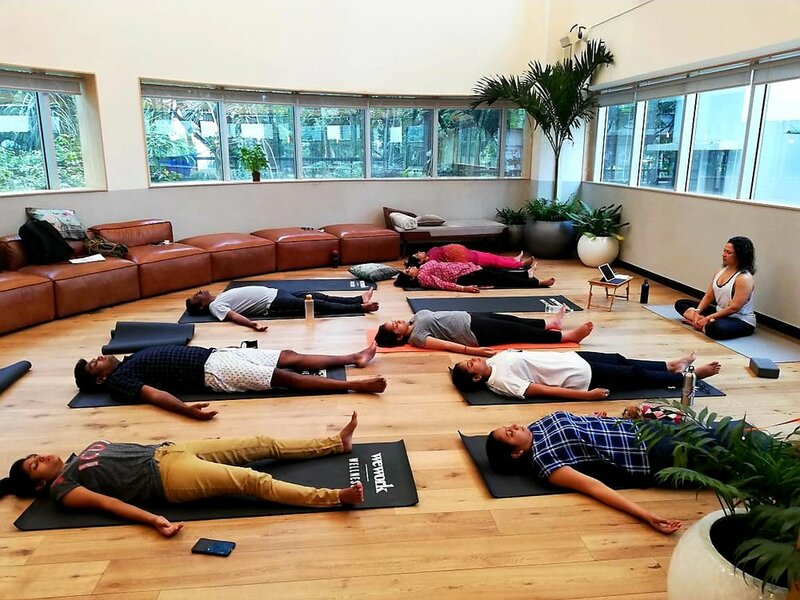 The objective of the brunch was well - WELLNESS - combining the invigorating practice of Kundalini Yoga, conducted by me (Avril Q) followed by a light, hearty organic brunch cooked in the Mimansa kitchen. 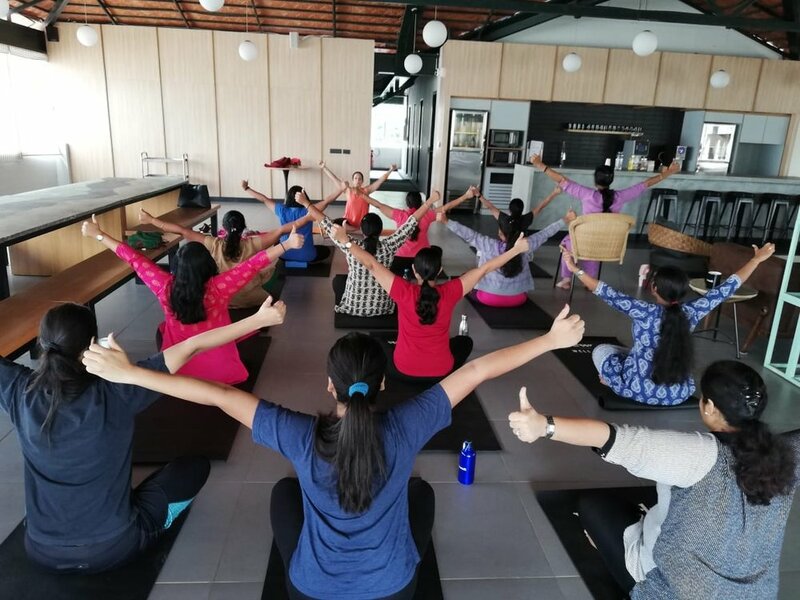 We had a vibrant group of women and men and even though they had never done Kundalini Yoga before, they dived right in with fervor and excitement and picked up the Asanas and Mudras very well. They asked intelligent questions and expressed an interest to be on my mailing list so they could come to my other Kundalini Yoga workshops in August. Some of them were interested in pursuing customized therapy with me. After the class we enjoyed a healthy and delicious brunch with organic and vegan food and chatted as a group for quite a long time. They were eager to hear about my experience with Kundalini and they shared their experience of the class with each other. I really felt like I made a difference in their lives and of course, I made new friends. I will keep you posted on when I will be conducting the next Yoga Brunch. A big thank you to everyone who attended - I loved your energy and enthusiasm! And also thank you to the lovely people at Mimansa for the amazing feast! 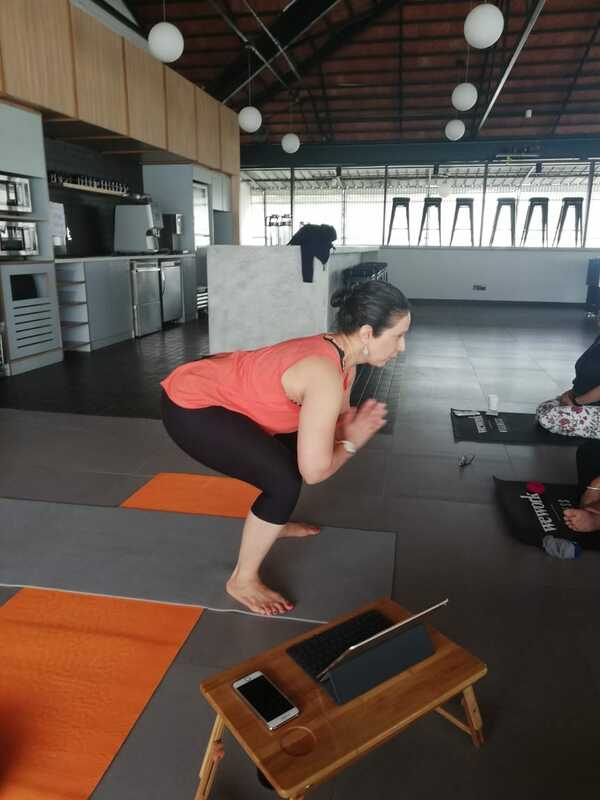 Avril Q conducted a 2 hour workshop encompassing the essential elements of Kundalini Yoga on Saturday 7 July in the relaxing environs of WeWork, Kormangala. The workshop focused on the various systems in the body and Kundalini Yoga asanas using breath and meditation that focused on these systems. The session ended with a QnA with Avril and coffee, courtesy WeWork! Here are glimpses from the workshop (Can you spot the furry yoga aspirant?!) and feedback from some of the participants!